ALBANY – County executives from across the state sounded alarms Monday that local property taxpayers and services will suffer unless key changes are made in state budget provisions under consideration at the state Capitol. From county jail costs to a new requirement that counties make annual payments to local municipalities, the county leaders – Democrats and Republicans – said the 2019 budget plan in Albany is unfriendly to both counties and local taxpayers. Counties noted the state’s budget has grown in 10 years from $121 billion to $175 billion last year. “We think the state of New York has a spending problem, and over the years and decades it has become too reliant on local taxes” to fund state obligations, said Stephen Acquario, executive director of the New York State Association of Counties. The biggest concern from counties is how Gov. Andrew M. Cuomo wants to change the funding stream for the Aid and Incentives for Municipalities, which is how the state for decades has helped fund the operations of towns, villages and cities. In January, Cuomo proposed cutting $60 million to more than 90 percent of the 1,400 or so towns and villages that get annual AIM funding. A month later, he proposed restoring those cuts, but said he wanted to have counties pay the $60 million tab to keep the AIM flowing to the affected communities. The idea is still on the negotiating table this week as Cuomo and state lawmakers attempt to finalize a new state budget, which is due to be in place before the new fiscal year starts on April 1. 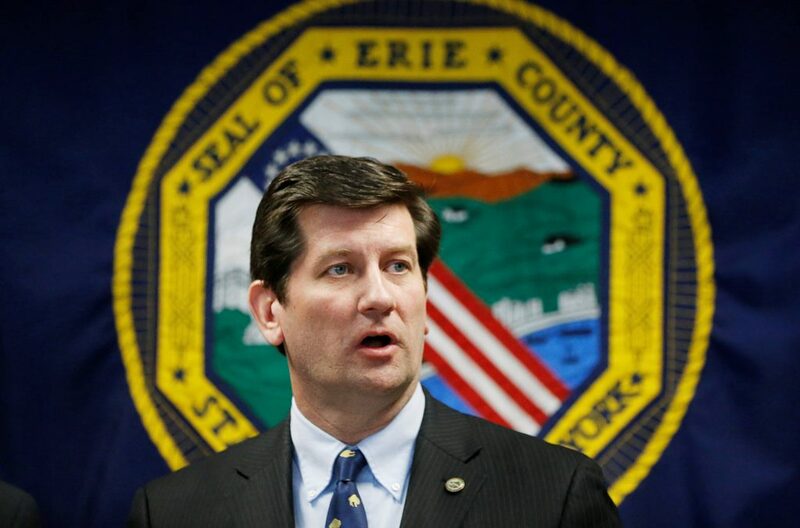 “We are disappointed in this action,” Erie County Executive Mark Poloncarz said Monday in a conference call with other county leaders. Poloncarz, a Democrat, noted that his county shares about 46 percent of sales tax revenues it gets with other towns, villages, cities and school districts in the county. “You’re hurting every one of those communities,” he said of Cuomo’s plan. Poloncarz said the provision offered by Cuomo, a Democrat, will have a multimillion dollar hit on Erie County and end up affecting localities that rely on the county’s sales tax revenue-sharing provision. The Cuomo administration on Monday defended the budget plan. The administration notes that counties are going to be bringing in new sales tax revenues if state lawmakers go along with Cuomo’s plan to start collecting sales taxes on third-party sales that use sites such as Amazon to sell their products. “Our budget puts local businesses on a level playing field with online retailers while raising $220 million in sales taxes for counties outside New York City, meaning it will generate enough revenue to ensure towns and villages are kept whole following changes to the AIM program while still leaving most of the new revenues to counties to bolster their budgets or provide tax cuts,” said Freeman Klopott, a spokesman for Cuomo’s budget division. Robert Mujica, the governor’s budget director, later called to more forcefully reject the counties’ claims. Besides the $220 million counties will get from a new internet sales tax, he said many counties will share $120 million in total from an energy tax sales charge. The state is also, Mujica said, covering local costs associated with a criminal justice law known as “Raise the Age” and will pay $128 million this year to cover the growth in Medicaid that several years ago would have been paid for by counties. “It’s not just that this budget is generating hundreds of millions for local governments but we’re also picking up local costs and trying to make the property tax cap (program) permanent,” Mujica said. But county leaders Monday said the governor’s budget is adding new costs to local government budgets with other plans in the proposed 2019 budget, including cuts to community colleges, early voting requirements and possible legalization of marijuana that will affect everything from local traffic enforcement expenses to the work of health agencies. Albany County Executive Daniel McCoy, a Democrat, criticized state officials for cutting local leaders out of any of the state budget talks. He said he has one recourse “if the governor shoves this down my throat like every other thing he’s doing” – charging municipalities whose residents attend the local community college partly funded by Albany County. McCoy, president of the New York State County Executives Association, said there are other looming new costs for counties in the 2019 state budget. If the state moves ahead with closing three upstate prisons, as Cuomo has proposed, some number of state inmates are going to end up in county jails being paid for by local taxpayers. And if the state goes to a new cashless bail system for people arrested for misdemeanors and nonviolent felony offenses, counties could face extra costs associated with new pretrial procedures for such individuals, county leaders said Monday. McCoy likened the prison closing plan to an effort by then-Gov. Mario Cuomo decades ago that ended up raising county mental health service expenses. “The son’s following the father’s lead,” McCoy said. Mujica disputed the prison claims. “State prison closures have zero impact on local jails,” Mujica said of the two different prison populations. The Albany County executive said the state is using counties to try to fix a hole that is opening in the state budget because of declining state income tax receipts. “That’s not my problem. That’s your problem. … You figure it out,” he said of the governor’s state budget situation.